Life starts out so simple. Most of us began riding a simple trike, no derailleurs, shifters or even a chain. One gear wasn't enough and the Bendix 2 speed came along. Then 3, 5, 10, 15, and today there are a few with over 100 gears. The Derailleur system was a brilliant design allowing efficiency, cost and reliability all in one package seemingly a technical impossibility in the engineering world. Some will say its still the best while others prefer Internal Gear Hubs (IGH) which enclose the gearing nasties inside the hub. Our engines work most efficiently at a narrow range of pedaling speed or cadence. Averages of about 75-110 RPM, faster for shorter legs, slower for longer legs so various ratios enable us to go faster for longer distances with less fatigue. Recumbent trikes make the most of gears as we may ride up steep grades at slower then walking pace speeds, while we roll down hills streaming past "Speedo Torpedoes" pedaling like madmen to avoid getting passed in utter humiliation by grandpa on a tricycle. Just having a wide range of gearing isn't enough. Steps between gears need to be spaced such that the difference in cadence from one gear to the next is within our peak efficiency zone; typically about 5-10 RPM. We keep adding more gears in seemingly a never ending per suit of gear-happiness. Road bikes generally have 3 types of terrain; flats, up hills, and downhill's. Once rear derailleurs were invented with 5 sprockets on the cassette some genius came along as added a front derailleur first with 2 sprockets, later 3, to match the ranges to the type of riding. A middle Chainring for flats, a granny Chainring for up hills, a big Chainring for downhills. In the competitive world of biking OEM's responded with more sprockets. On the rear, 5 went to 6, then 7. The trouble was squeezing more then 7 gears between the rear dropouts the hold the hub was getting tight so for 8 speeds there were new standards of slightly narrower chains introduced. Everyone was happy or so it appeared. But 8 wasn't enough so 9 came along with a slightly narrower chain. Then 10, then 11, each with narrower chains. Meanwhile the width of the cassette remained the same so as the sprockets and chains got thinner, so did the accuracy for shift indexing. While all this gear madness was going on engineers were also busy finding ways to grind little ramp valleys and install pins on the sides of the sprockets to enable the chain to leap from sprocket to sprocket much faster and with more power applied. Its been over 50 years of engineering evolution to bring us to where we are today. At some point the number of sprockets on a cassette will reach a maximum due to the space allowed. Moreover as cassettes have grown beyond 9 sprockets efficiency the harbinger of derailleurs, begins to diminish. Chains, sprockets and shift accuracy become less reliable. And the omni-present sound of chains crunching from sprocket to sprocket becomes more persistent. No one is ever satisfied with elegant simplicity. Rear Derailleurs have all but lost the elegant simplicity the once had. Shimano, SRAM and Campagnolo have all gone mostly separate ways in terms of interchangeability between parts excepting the chains as chain manufacturing isn't really a core piece of their business. As the cassettes have been squeezed to fit more sprockets the indexing accuracy requires much more precise shift points for the Shifter Detents. In fact everything has to be more accurately aligned and positioned. SRAM and Shimano both make some really fine Rear Derailleurs but anything over 8 speeds the simple axiom "you get what you pay for" is the gospel on component selection. Some trike OEM's have stepped up in the number of gears using rather inferior derailleurs. Not that they don't work, but they need frequent adjustments and after a short time seem to wear just enough that they can never be adjusted to prevent the annoying chain rub sound somewhere in the middle if the rear cassette range. You know, that ticking sound that sweeps your confidence that the gear is reliably engaged. If you're planning to upgrade an 8 speed system to a 9 speed system, you'll need to replace the chain, and possibly the Chainrings as well. Same applies between 9 to 10 and 10 to 11 speed configurations. Squeezing the added gears requires a narrower gauge of chain. Bikers are willing to pay premium prices for the latest and greatest. So as 9 speed stuff came out, the prices on 8 speed stuff plummeted. Repeat that for 10 speed, and now 11 speed. 12 speed is just around the corner. Bottom line is you may be better off with a high quality 9 speed Rear Derailleur system and a wider range of Chainrings. Shimano Rear Derailleurs use a 1:1 cable pull. SRAM decided sometime through the era of 8 speeds to change from a 1:1 to 2:1 cable pull. What that means is the shifters are not interchangeable between brands. 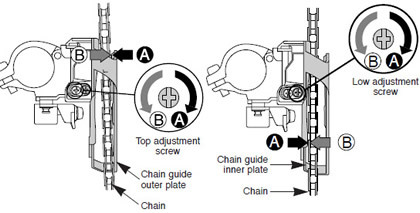 Note that the Basic Adjustments do not include Chain Tension and Chain Growth that may occur on some suspended trikes. Cassettes of sprockets that the rear derailleur shifts though come in a wide variety of ranges and mounting styles. Most trikes are fitted with Mountain Cassettes. Some cassettes can be disassembled and custom fitted with various sized sprockets. In the quest for the widest range some enthusiasts will custom fit a really large sprocket like 38-42 teeth on the biggest side, and many of them who have later discovered the derailleur wouldn't clear the oversized sprocket. Caveat Emptor. Sprockets will wear and sometimes teeth get bent. The more sprockets on the cassette, the thinner the gear. The thinner the gear the more quickly they wear, the easier it is to bend. Also, above 9 speeds there simply isn't enough thickness to grind ramp grooves so shifting under power begins to be compromised. Chainrings generally have a pretty large variance in size so the front derailleur alignment is critical. Front derailleurs also have cages of various lengths; longer cages will allow a wider range difference between Large and Granny gears. On a trike the front derailleur is often in view which is a good thing as the fronts are not indexed to click into position. Often when a shift is made the rider will need to "overshift" the shifter to force the chain up to the next higher Chainring. Once the chain is on the correct Chainring the overshift position will allow the chain to rub slightly on the derailleur cage, so the rider will want to carefully back off the shifter position to center the cage over the chain. Front derailleurs mount on a derailleur post and should be positioned so the that cage can clear contact with the chain and sprockets. With the cage aligned to the chain, the adjustments are pretty simple. One of the most common front derailleurs equipped on trikes are the Microshift brand. When adding a front derailleur to a trike that does not already have one be sure to measure the diameter of the post as the clamps come in 2 sizes; 1.25", and 1.375". Either way you'll be disappointed if you go to add a front derailleur and have no way to mount the cable sleeve. 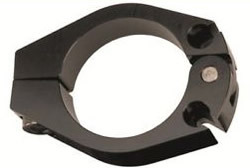 There are aftermarket cable clamps like this one from Problem Solvers that can be mounted to hold the cable sleeve for about $10. Derailleurs require Shifters; in the Shifter page we'll discuss various styles and include how cable pull drives the matching of shifters to derailleurs.